Shri Baglamukhi Maha Yantra is for power, victory and dominance over enemies. Controlling deity of baglamukhi yantra is Goddess Baglamukhi who is the controller of this powerful occult Baglamukhi Yantra. It helps achieve success in law-suits and competitions as well as pacify quarrels to the worshipper’s advantage. 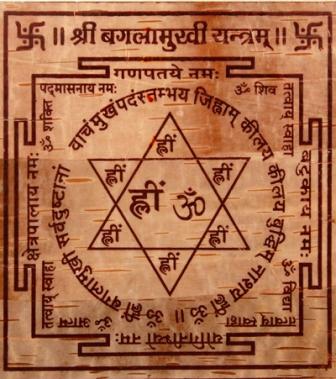 The worship of this Yantra is performed in a particular star sign and moment when there is maximum power generated by the planet Mars. The Bagalamukhi Yantra is also effective in warding off evil persons, spirits and Yakshani.